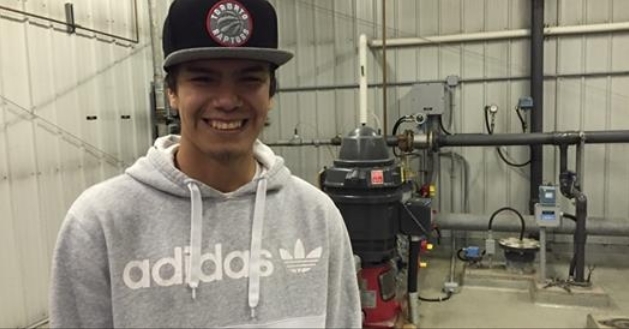 Now, a unique program spearheaded by the Northern Chiefs Council (Keewatinook Okimakanak), is allowing people like Quentin Rae to take the initiative and the responsibility for providing clean water in their own communities. "I have to take care of the plant, make sure chlorine gets in the water to clean the bacteria," said Rae with a smile during his first week on the job at the end of April. The high school diploma is the prerequisite for the training provided by Northern Chiefs Council that will provide Rae with his operator certificate. Once the water plant in North Spirit Lake has a certified operator, the boil water advisory can be lifted. But the program goes beyond the training. "We want the community to own and fix the problems," Strachan said. "The best way to build the confidence in their own ability to run these systems is to let them do it and support them while they are." Strachan admits First Nations need sound infrastructure in place first, before the monitoring and training system will work. The program has already resulted in removing boil water advisories in three other northern Ontario First Nations. Meanwhile, community leaders in North Spirit Lake are pleased to be able to offer new opportunities to the young people. "That young fella, he just graduated from Grade 12 and we gave him an opportunity and he jumped at it," said deputy chief Donald Campbell. "I think he's very excited and he'll be a good asset for our community as he grows and learns." Responses to "Meet the teenager who solved his First Nation's drinking water problems"
So impressed with this wonderful, caring young man. May his every good intention be blessed with success. Quentin Rae you are AMAZING! Keep on keepin on. You are destined for GREAT things. The SPIRIT is in you. Happy for you Quentin. Your people in the community will look up to you. Keep on training and learn up to date ways of operating the equipment. thank you for caring about the water. you have a very important job. Quentin you are an awesome role model and a legend!